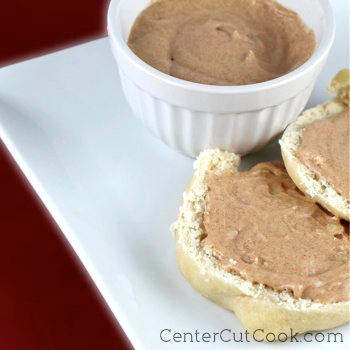 This Cinnamon Butter is sweet with hints of honey and cinnamon. Slathered on fresh out of the oven rolls? Delicious! As a kid, I pretty much disliked everything about Thanksgiving Dinner except for the homemade rolls and mashed potatoes. I LOVED rolls, especially the kind that all of the women in my family would make from scratch. I’m pretty sure I ate more than my fair share at family dinners. My mom, my grandma, my aunts, everybody knew how to make a good homemade roll. Eventually I learned about carbohydrates, and moderation, and outgrew my love of rolls-in-excess as I got older. I no longer go crazy over bread and rolls these days like I did when I was a kid, but let me tell you, the first time I tried the cinnamon butter to slather on the rolls at a restaurant called Texas Roadhouse, I knew I needed to find a copycat recipe. It’s been years since I told myself I was going to figure out how to make it, and just recently I finally did. This recipe isn’t an exact replica, but it is much like the cinnamon butter you’ll find at Texas Roadhouse. It’s sweet, with hints of honey and cinnamon. Slathered on fresh out of the oven rolls? Delicious! A little goes a long way! I wish I had a fabulous recipe for rolls to share with you, but I don’t. I experimented with a new recipe which is pictured along with the butter, but they were just ok. Whether you’re using this cinnamon butter for homemade rolls, or you’re using it on toast or a bagel, it is simply delicious. In a bowl, mix together butter, confectioners’ sugar, honey, and cinnamon. Beat on medium speed until it is blended well.